I deeply believe in the power of visualization. Since my senior year in college at Kent (1991), I’ve been creating vision boards to help manifest my dreams and desires. That was way before vision boards were trendy! Graduation from college was something I’d fought to achieve, and I was hoping my degree in Marketing/Communications would help me catch a break for my future. That and prayer. I left home at 18, taking everything I owned stuffed in the trunk of my ’82 Chevy Citation, and taking on responsibility for myself. I worked three jobs to pay rent and tuition. Fortunately (then, not so fortunate now) I am a chronic insomniac. My dyslexia made my studies twice as hard, so my late night wakefulness helped me stay productive and get good grades. When graduation approached, I was so ready to land myself a dream job and move out of my 350 square foot studio apartment with the fold out bed! I was still a practicing Catholic back then and I sent up lots of prayers to the Big Guy, hoping his blessings would come my way. I also started my lifelong practice of visualization. It’s a powerful mind exercise that sends out a frequency to the Universe. Like prayer, I believe visualization works. To focus my visualization practice, I started collecting articles, photos, and maps of what I hoped to accomplish and experience, and taping them to my dresser mirror. I included the business cards of the people I’d hope to associate with who matched my own frequency of happiness and success. I added affirmation and quotes that lifted me up, too. When I had nothing more than a few square inches of mirror left, I moved it all to a cork board near my desk. My husband has a great saying: "You can pray for potatoes all you want, but you have to pick up the hoe and work the field, too!" For someone who never finished college, my husband is pretty smart. My visualization board reminded me that I had put in the work and I could do anything, ANYTHING, I set my mind to. The proof was right there, tacked up on my trusty board! On May 20th, 1991, I donned my cap and gown and received my college diploma. A diploma I had paid for and earned entirely on my own. Despite being finished with my studies, I spent time every day at my desk in front of my board, meditating, reflecting. Soon after that, a funny thing started happening; the scenarios on my board started becoming real. One by one, the persons, places and opportunities I visualized came knocking. Sometimes I wasn’t ready to open the door. It took a few years for me to realize I had to be open and receptive for what the Universe was offering … and it offered so much! As I started my marketing business and work consumed my days, I made fewer and fewer boards. My vision boards were always positive affirmations. I surely didn’t manifest things like my cancer diagnosis in 2017 — who the hell would! But when cancer came along, I had no choice but to be open and receptive. It came to teach me something. It came to help me reprioritize. It came to tell me "be careful what you ask for." For the first time in many years, I started off 2019 creating a new vision board. It manifests what I want my life to look like as a healthy and thriving survivor. It’s still in its infancy, but I feel myself gathering strength and purpose from it. 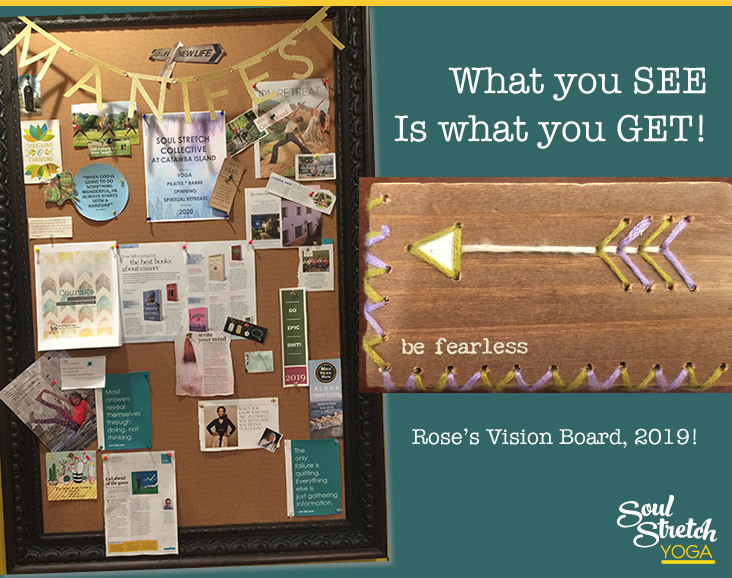 I can’t know what the future will bring, but my vision board helps me stay open and receptive so that when opportunity knocks, whether good or not-so-good, I am ready to answer the call. I usually don’t ask much of my readers, but I’d like to challenge you to make a vision board for 2019. Forget about New Year's Resolutions; they generally don’t work and we end up stressing over impossible goals. I’ve had many “cans” in my life. 2016 ushered in my first yoga studio. 2017 saw my first YTT (yoga teacher training). And in Fall of 2019, I plan to lead my first ever yoga/nature retreat. I’m going into the heart and soul of my native homeland, Italy, on a journey titled Eat, Pray, Practice: A Yogi & Food Lover's Tour of Tuscany. Stay tuned as more details are coming soon. Put it on your vision board! Happy New Year, Lovelies and Manifest!